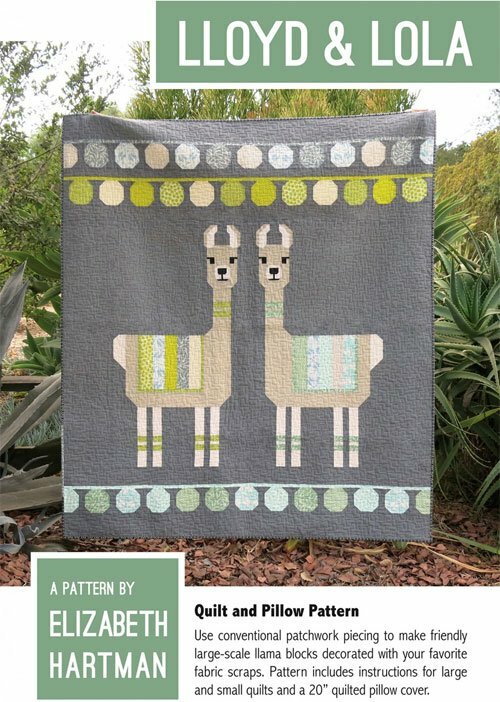 Lloyd & Lola quilt sewing pattern by Elizabeth Hartman. Lloyd & Lola are friendly large-scale llama blocks, complete with pieced blankets and decorations. The large and small quilt designs in this pattern also include festive pieced ball fringe. The pattern also includes a 20in x 20in pillow pattern, featuring a llama face and more pieced ball fringe. All projects are made using conventional patchwork techniques. No paper piecing! The pattern includes a complete list of the cut pieces need to make a single block, making it easy to use scraps or make single blocks for other projects.